Free Herrera Estelí Norteno Coronita 5-Pack + Free Shipping! 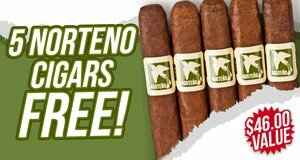 Buy a Box of Herrera Estelí Habano and Herrera Estelí cigars, get 5 Herrera Estelí Norteno Coronita cigars, valued at $46.00, absolutely FREE plus get free shipping on your entire order! Free Herrera Estelí Norteno Coronita 5-Pack cigars + Free shipping!